Mark Van den Borre: Support free software! 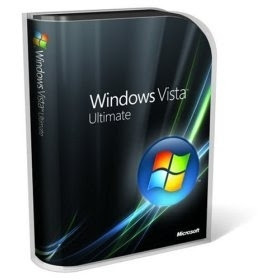 Buy this copy of Windows Vista Ultimate! Support free software! Buy this copy of Windows Vista Ultimate! A somewhat ... unusual charity auction. 100% of profit goes to http://ubuntu-be.org, the official local ubuntu team for Belgium. The story behind this original boxed MS Windows Vista Ultimate Edition is quite exceptional. With ubuntu-be.org, we had a booth at a conference on IT in education. One of us, François, started talking to the people at the Microsoft booth and received this box as a gift (carrot/bribe?) from a Microsoft employee. Since he only uses Ubuntu on his pc, he doesn't need this MS Windows Vista thing. He decided ubuntu-be.org could use money better than a copy of Vista. So here's your chance to support free software by buying Windows Vista! i don't think any ubuntu user want that. Why don't you just returned to a store and get a refund? You can do with it whatever you want if you buy it, including blowing it up. To us, this box is worth only what the fool is prepared to pay for it. We hope to be able to use the proceedings for some printing work or a second hand laptop for ubuntu-be.org. It's neither a carrot nor a bribe. It's actually the stick! "Go use Vista, you naughty boy!!!" I could pay to see it blown away in million pieces by an explosive. Haha, I wish I could do that with my express upgrade. Unfortunately, it only works on my hardware. >To us, this box is worth only what the fool is prepared to pay for it. Considering the fact that someone may be using this opportunity to deliberately bid on something they don't want purely to give you some cash... you could just have inadvertently insulted someone donating to you. Better to sell this thing to someone who might have a use for it. Blowing it up doesn't help anyone (ok ok maybe our ego). Come on guys. As superior as Linux is in so many ways, Vista is not without merit or MS would be out of business and they're not. You may not prefer it but it's not without value - especially in the corporate world where suit monkeys make decisions everyone has to live with - like "we'll use MS only"
"To us, this box is worth only what the fool is prepared to pay for it." It's a shame that you have to frame it that way. Contrary to what you might believe, there are those of us who have legitimate uses for Windows Vista and who - quite frankly - don't mind and even enjoy working with it. Being a Windows user doesn't automatically disqualify the individual as a fool - though from this community I should probably expect this level of thought. Not long ago I wrapped up a test where I ran Ubuntu on one of my render boxes for a few months to see how I liked it. Although I didn't stick with it, I was going to take this opportunity to toss some money towards open source software, since it's a cause I can support - and I can use an extra copy of Vista for a new box I'm putting together. But frankly, I find your comment insulting, so I will have to bid you good-day and wish you the best of luck with your endeavours. Yeah, that was quite fool of you to say that, wasn't it? which will mean MS is supporting Ubuntu-be. If they don't want that kind of money, this copy should simply be destroyed or returned. 'Hey linux nerds.' - Hey tard, how was your day? your a special boy. 'I bet a 2 GB workstation with Vista is a better user experience than Ubuntu.' - What does 2GB have to do with? 'Why? because i dont have to hack it to to these:1. Get wifi to work 2. Use my iPod' - Well, if you had an IQ above 80, you could work out how to recompile a kernel, which is not 'hacking' its configuring, as for the ipod... its the most popular portable media player *out* there, I'm sure somebody smarter than you has got it to work. 'Besides, I can actually play games and develop web applications with same tools as you guys (e.g. Eclipse)' - Wow, you really are special... how kewl you can make ur windowz desktop like linux... we can use your tools too, we have free emulator software and layers (Qemu, Wine)... not to mention a broader range of software and additional power. AND let me tell you Editplus is much better text editor than anything you can dream of in linux-land. - Hey look, I just emerged wine, and tried this program, and guess what... it works! Telling us that anyone with an IQ of 80 or above should be able to recompile the kernel. Sure, tell that to the millions of home users who only want to buy a $500+ computer from Dell, take it home and plug it in, with all the color coded plugs. Get on the internet and send email All without having to recompile the operating system. Get real, Linux/ubuntu is great for those hobbiests but not for the masses.. Even though ubuntu is great, give it to your grandmother without installing it and let her do the install, and see how long it takes her to get her email and get on the internet without you putting your fingers on the keyboard or telling her what to do. See thats the the thing with Linux and its users. "It just works" our linux community is always overjoyed over the fact that they actually have an app for linux (i.e. it exists) you'll moan only if you had options. and believe me I've traversed the OS world my triple boot macbook also runs Ubuntu linux which I frequently use. I do believe a linux server is the best thing you can use (I run a webapp on with weblogic). The desktop experience of linux can't beat windows in next 5 years and Mac OS X in next 10 years!! I didnt say that they should know how to compile a kernel, but figure out how (Not to mention this guy is a some professional web developer that needs his elite textpad to design). While I agree with you that with the latency between new hardware being released and being fully supported under linux means that for a while users are left out in the dark, things are changing and 'super elite web developers' should be able to figure it out. 1)"To us, this box is worth only what the fool is prepared to pay for it." This is a quite standard expression in Dutch. No negative connotations at all in the sense of all buyers of Windows vista being fools. It's just a way to say "it's worth what the market thinks it's worth". 2)"Microsoft is being nice to you, and you are being mean by selling this." François received a gift from someone he hardly knew on behalf of a multinational company. This was a well appreciated act of kindness. Surely the giver will appreciate François actually benefiting from this gift! 3) "Ubuntu is not ready for the desktop." That's your opinion. You're entitled to that. Mine is different. I like Ubuntu. I was easy to install and the web forums made it really easy for me to find support. Setting up Wi-fi was much easier in Ubuntu than it is in Windows and Gedit is an excellent text editor so I'm not even going to try this other editor. Ubuntu runs faster on all my computers than Windows XP/Vista does and the auto-updater facilities make sure that my software is always up-to date. Now you can say games don't work. If you go to any big games retailer you will find that lots and lots of games actually dont work on Vista. 'Game' in Belfast have had to put stickers on games to indicate which ones work with Vista. I had no problem getting many of my games to work under Ubuntu, even ones that woouldn't work in XP or Vista. Both operating systems have their good and bad features but I think I'll stick with Ubuntu. It's great that I can just download an Ubuntu cd whenever I want and not have to eneter a 20 digit rgistraion code. This box could be used as as symbol for the Free Software : Windows is better used in its box! The buyer should never open it and better sell it again for an other Free Software project. I agree with alchemist: it looks like a great box to put your monitor on, especially usuable for conferences. I want it but the link doesn't work. Why not just return it and use the money for Ubuntu. It's easier than trying to sell it, though selling it to someone who wants to Youtube a disk smashing would be cool. Did you give the poor MS people some Ubuntu CDs in exchange? Reason for selling: Ubuntu is vastly superior. Seems like even Microsoft cannot give Vista away, it really is that bad! I never want to use it, and I really enjoy using Ubuntu and other Linux distros, and sometimes Windows XP. With Vista, Microsoft just threw out all the good bits of the OS to replace them with something a fancy designer came up with. Why is this popping up on Planet Ubuntu again?